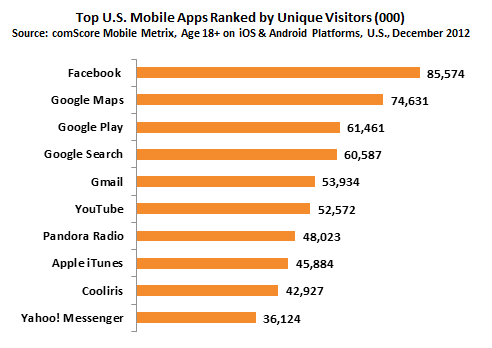 Facebook has surpassed Google Maps and become the #1 mobile app since October, after Apple decided to replace Google Maps with Apple Maps on iOS 6, and is still holding the first place in the end of the year 2012, said comScore today on its website. Meanwhile, Google Maps has been clawing its way back the past few months, so look for the competition for the #1 spot to heat up in 2013. Facebook got 85.5 million unique visitors in December, Google Maps got 74.6 million. Despite losing the #1 position, Google maintains a strong leadership in the mobile app market- with 5 apps ranked in the top 6 apps. Wow! These are some really useful and entertaining android apps are here. Many of these applications are really awesome, especially the one named as Facebook. It's really an amazing application helps to keep alive in social world. This mobile application may also used for marketing purposes. Thanks for sharing some really fantastic applications here.